Winter has arrived in western Massachusetts. It came in with a bang, dropping a foot of snow the day before Thanksgiving. Needless to say, the waterways are beginning to ice up. 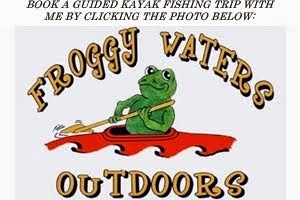 I will do some fishing this winter on the local rivers, but lately, my attention has been focused on the woods. Although I haven't found the buck I've been looking for, it has been a great season for the family and we still have a few weeks to go. Archery season was rough. I didn't get to hunt as much as I wanted and when I did, I was seeing everything but a buck. Here in western MA, pulling a doe tag through the lottery is rare, so only bucks for me this year. I saw does, fawns, turkeys, a bear, a bobcat, grouse, rabbits, squirrels, woodcocks, a pheasant, and coyotes. I don't think I have ever seen so much wildlife without seeing antlers. To further frustrate things, during the peak rut we had a week straight with winds above 15 MPH, often gusting well over 30 MPH. Although deer were more active, it made them nearly impossible to pattern and it seemed like no-one was having any luck. Between archery and shotgun season we did some small game and bird hunting. One good Saturday resulted in a couple of healthy woodcocks that we turned into a delicious hash. Too bad we also missed a few of those crafty critters. Finally, firearm season opened up for whitetails. Here in MA, they don't have a rifle season, only shotguns and black powder. Mary May, her parents, her brother and I all hunted together the opening two days of the season. It didn't take long the first morning before the shooting began. My mother-in-law, Johanna, missed one just before 7 AM. We saw some tails and blurs the rest of the day, but nothing that we could get a shot at. MM and I had to leave a little early that evening because she had a work dinner she couldn't miss. 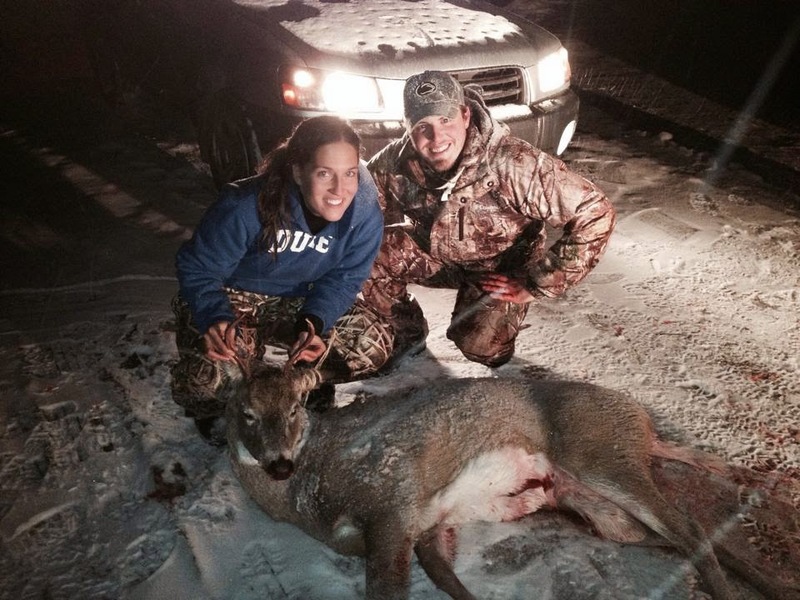 But around 6 PM, her dad and brother pulled in to our house with a nice 8-pointer. My brother-in-law, Jason, had bagged the brute just before dusk and roughly 1/4 mile up the hill from us. It dressed at 127 lbs and was a beautiful deer. The next morning we were back at it. Around 8 AM my father-in-law, Jerry, missed a doe (he is the only one of us who drew a doe tag this year). We saw a few the rest of the day, but never could quite get them in range. By evening, the rest of the crew had waved the white flag, but not MM and I. We headed out around 3 for one last sit. Finally, around 4:15 PM, I heard MM shoot about 200 yards from me. Then again. Then again. I figured she had missed given the number of shots and the fact that she hadn't texted me. It turns out that her phone was dead and about 15 minutes later I looked down a ridgeline to see her waving her arms at me. I hurried over to her and she quickly explained the story and showed me where she had hit him. The ground was covered in blood and I knew we needed to start tracking before it got too dark. It was a good shot and we found the deer fairly quickly, but it was a brutal drag uphill, through dense forest and in the dark while the sky spit sleet at us. The 5-pointer had a big body and dressed at 120 lbs. Last weekend we processed the deer, which is probably the hardest, yet most gratifying part of hunting. It involves skinning the deer and butchering the meat. 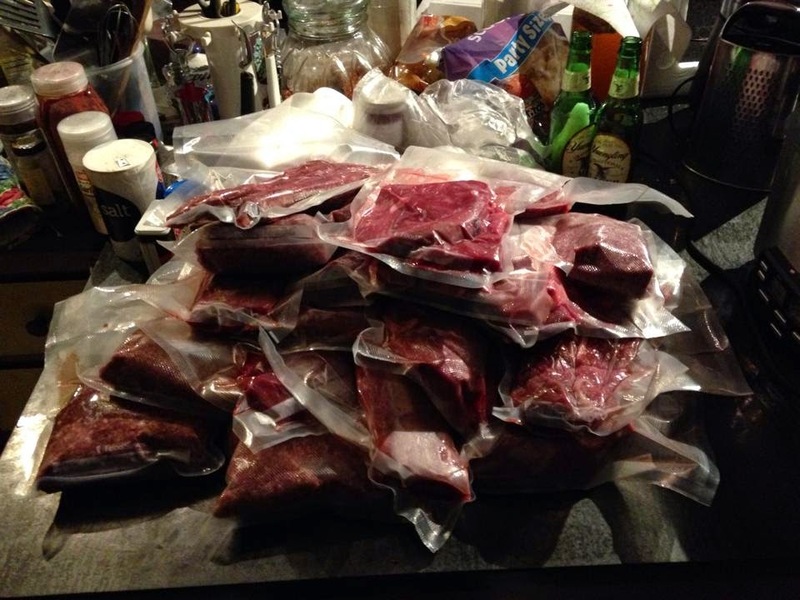 We ended up with about 22 lbs of loins, backstraps and steaks, 17 lbs of burger and 15 lbs of summer sausage - 54 lbs of total meat in the freezer. That is about a 45% yield, which we were very happy with given that we cut our meat very lean/clean before freezing. You hear A LOT of theories about how much meat a deer yields - ranging from 1/3 of the dressed weight to 1/2 of the living weight. The estimates are all over and many are extremely inaccurate to due hunters not knowing the actualy weight of the animal or the actual weight of the meat. Not to mention, you don't always know what you are getting back if you take your deer to a processing station/shop. This webpage (http://www.butcher-packer.com/index.php?main_page=document_general_info&products_id=331) is the best I have found for explaining how everything is related and how to properly estimate meat weight. We got to try out our new vaccum sealer (a wedding present) and it worked like a charm. Yet another investment that I should have made sooner in life. We are still loving the meat grinder we bought last year also. That thing is a beast. We are hoping to get one more deer before the season is done and process it into bologna, jerky and other various cuts. Good luck to all the other hunters out there around the country. Stay safe and stay warm the rest of the season! Tight lines! The idea regarding qualification, dollars, along with significant size shouldn't be the basis regarding selecting the actual collegiate option to training. Schooling must be according to kinds chance to obtain, maintain, along with employ training. college essay writing is the best one writing service for the students to prepare any college papers. This is marvelous. I do see some extraordinary plans among these and it is really difficult to trust that they are made simply out of circles and nothing more. I also found more information about it http://www.buzzfeed.com/hateplaymid/successful-women-of-the-21st-century-a-5-case-st-1pqlx I ponder, from where they really get this kind of thoughts. Winter is my favorite season. Here you discussed about winter season nicely. I am a researcher at how to write a good research paper. It is my pleasure to read your blog. Wow! Thank you for sharing the article.